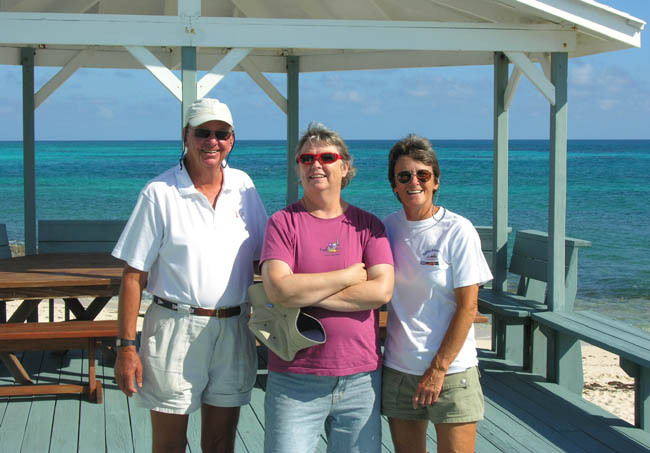 Paul & Ann Gooding owners of PDQ Horizons, and one of our companions on the Baltic Adventure last summer, have been coming to Hope Town for nearly 30 years! 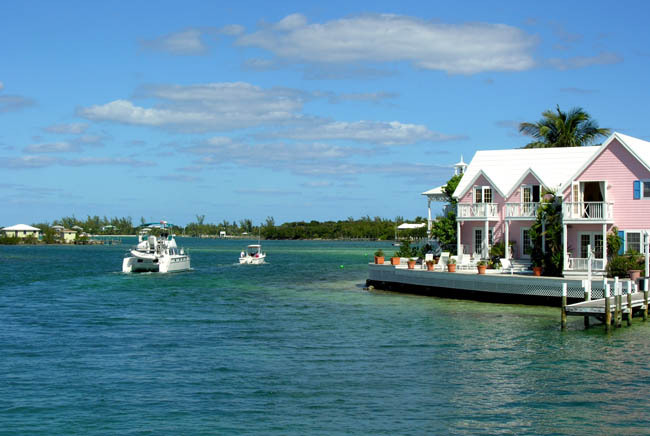 They had the foresight to buy property here when it was still affordable and they were pioneers in the development of the North end of the island where they built a beautiful house. 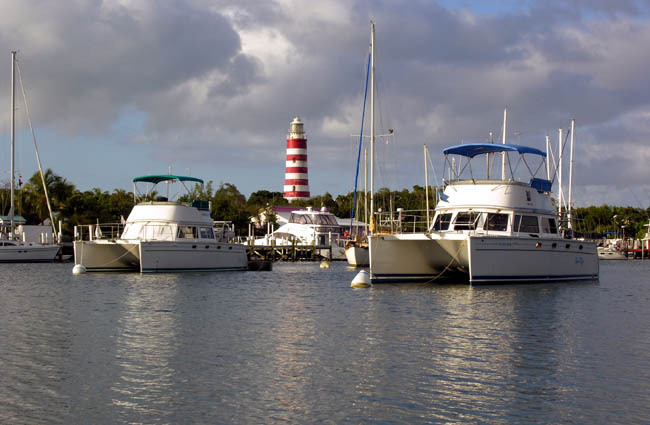 They were also instrumental in building a protected boat harbor for residents, and they continue to be active in the HopeTown Sailing Club which, among other activities, sponsors a sailing program for local children..
Horizons on the left, Sno' Dog on the right - and the famous non-electric, hand-operated HopeTown lighthouse in the middle. 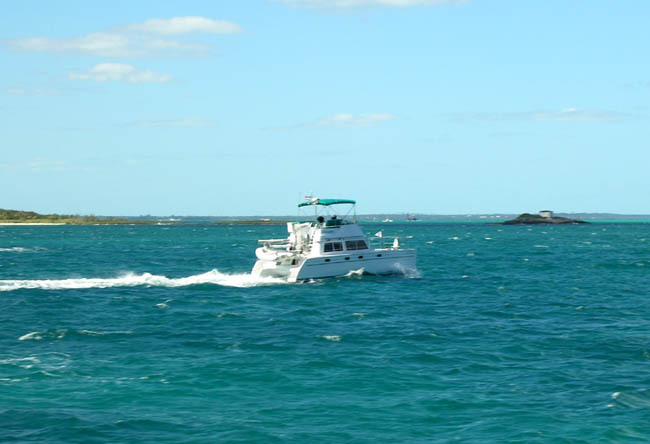 Upon entering HopeTown harbor, we spotted Horizons and quickly grabbed a mooring next to them. 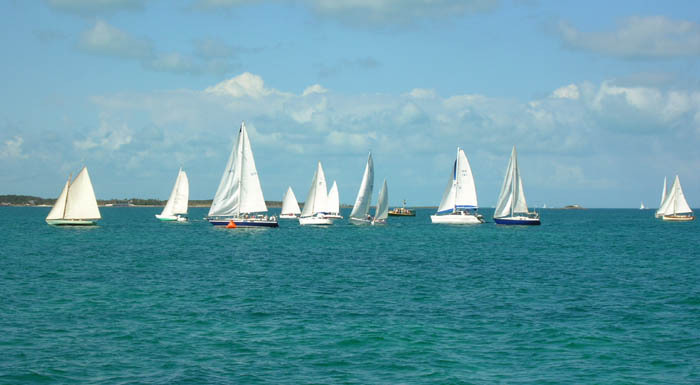 Left: The start of the Hope Town Sailing Club cruisers race - 15 boats, all sizes & shapes!! 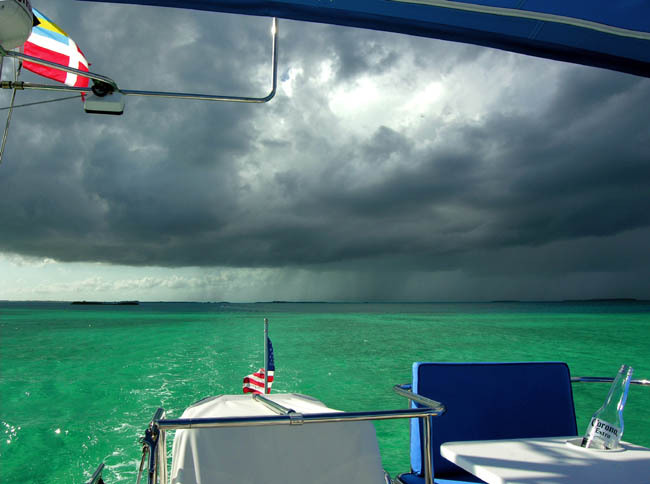 Another squall on the Sea of Abaco, again we missed the rain. Click on the photos to see larger size. 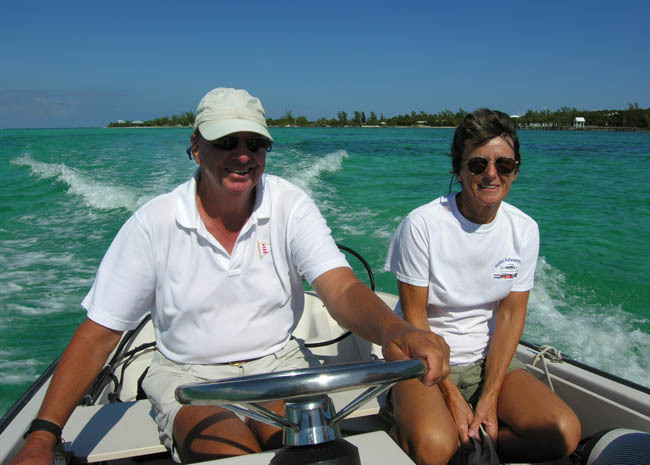 Paul & Ann asked us to join them in the annual Hope Town Sailing Club cruise. 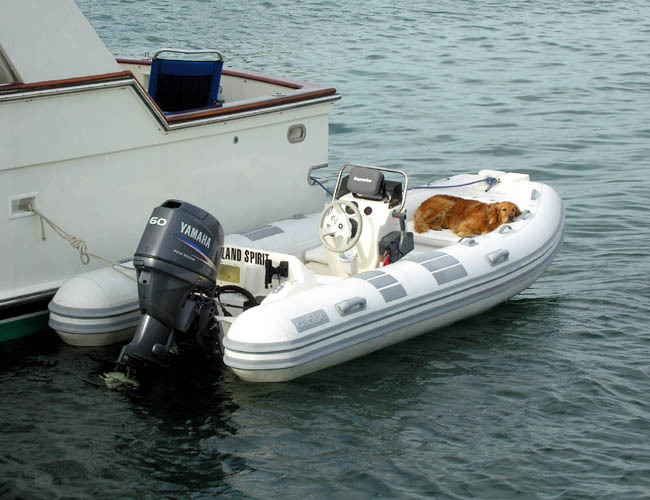 This year's expedition was to Teasure Cay, 20 miles NW of Hope Town. We happily tagged along as their guests. 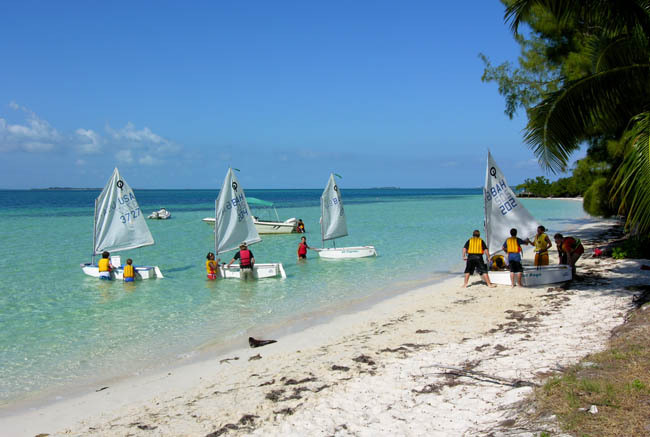 Click on the link below to continue our trip to Treasure Cay. 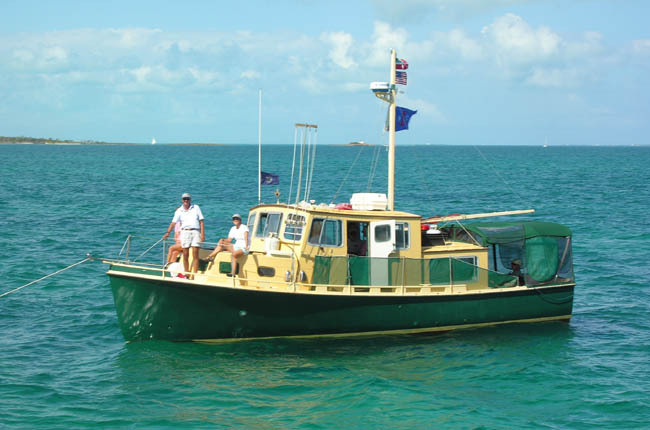 Heading out of HopeTown, Horizons leading the way . 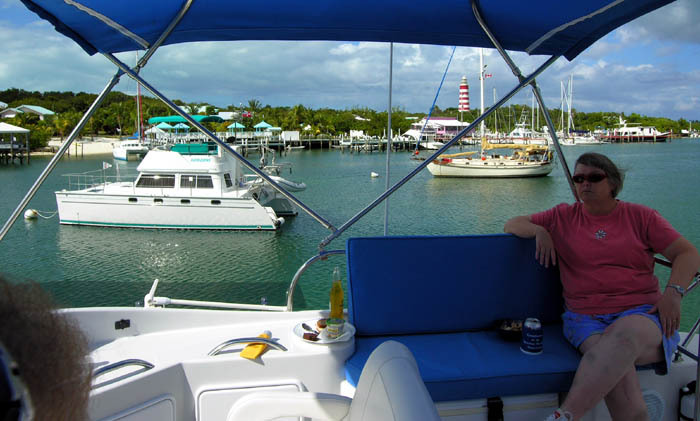 . .
Horizons heading for Treasure Cay . . . 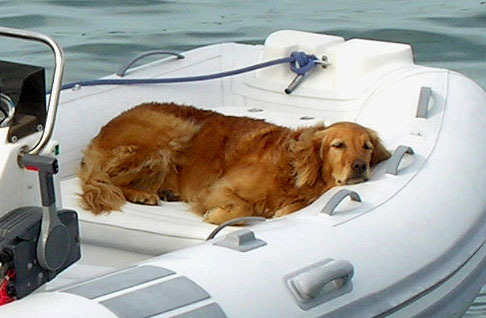 When the 50+ foot Island Spirit launched her dinghy, one of their two Golden Retrievers immediately jumped aboard and assumed this position. She obviously didn't want to be left behind. Their two super-friendly dogs were named Zoe & Chloe. We got to know them well. We miss our dog, Madison - the snow dog! 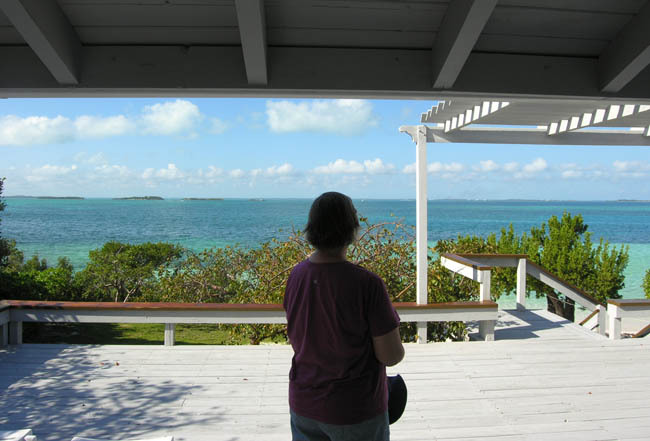 We had planned to bring her along - we even applied for, and received, the $10 permit from the Bahamian Dept of Agriculture, but at the last minute we took up Nancy's mother's offer to keep her in Florida. I gather Madison has been walking Belle twice daily!